In November, Twitter started testing an option to switch between algorithmic and chronological timelines in iOS, so users could opt to see either ‘Top tweets’ or the latest tweets from profiles they follow. It rolled out to iOS the following month, and it’s finally available on Android starting today. To try the new feature, simply update your app, and click on the :sparkles: button in the top right corner. 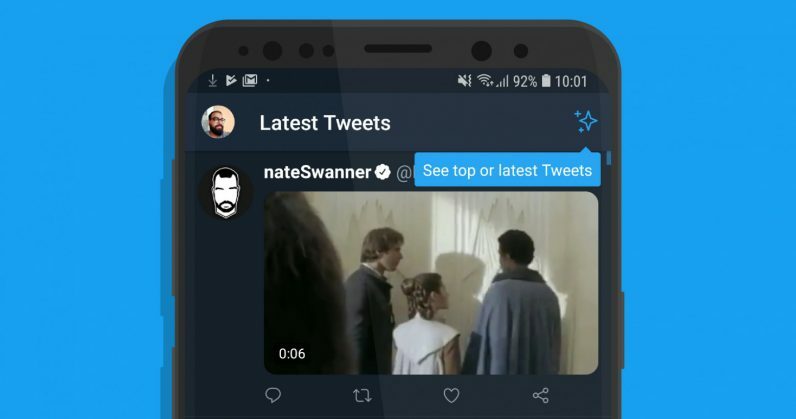 Next, tap See latest Tweets to switch to a chronological timeline. You can switch back to Top tweets at any time by following the same steps. It’s worth noting that the reverse chronological feed has been available in the Android app since September, but you’d have had to dig into the settings to turn off the ‘Show the best Tweets first’ option off to see it. The new button makes it a lot easier to access, and it might even encourage you to check out top tweets every once in a while. Now that this functionality has made it to both mobile platforms, I hope Twitter will bring it in its desktop and mobile site in short order. Maybe give us an edit button while you’re at it too, Twitter?